"Now, stepping through a second take on this announcement, I'd like to offer up some thoughts about what this means, and how I think this will impact Windows Phone going forward." Paul Thurrott has written a very insightful and well thought out analysis of the Microsoft-Nokia Strategic Alliance and concluded by stating, "Windows Phone is the most innovative smart phone platform on earth. Hopefully adding Nokia to the mix will only make it better. My guess is that it will." I agree with Paul that Windows Phone is the most innovative smart phone platform on earth and adding Nokia to the mix could potentially make the platform better, my biggest concern is the whole fragmentation issue. Paul mentions the fragmentation between WP7 devices in its current state as a luxury device and potential future entry market devices by Nokia. But, the fragmentation I'm mainly worried about has to do with the fact Microsoft's initial strategy with Windows Phone 7 was the baseline OS would be controlled by Microsoft itself and customizations were limited to added on apps and/or hubs. Thereby allowing OS updates to be pushed to each and every Windows Phone at the same time. A strategy that has been hugely successful for iOS as it avoids the fragmentation problem that currently plagues Android OS. With this new alliance, Microsoft is about to change its strategy in a major way. Nokia was granted the right to "customize everything." 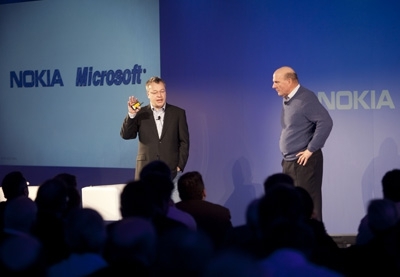 Stephen Elop later stated, "Nokia likely won't make extensive use of this freedom to tailor Microsoft's OS." However, this still sounds like there will be some use of the freedom, perhaps not extensive, but some use none the less. Plus there is no telling how long Nokia holds to this philosophy because the ability to differentiate your product in light of other numerous established competitors will be a strong motivator. So, in the best case scenario, Nokia releases phones with minimal customizations and there are two close branches of the OS. In the worst case, Microsoft grants other hardware and carrier partners the same ability to customize and we end up where Android is at. Hopefully my concerns are for naught and Windows Phone OS doesn't become the mess that Android has become. From the perspective of Nokia, they want the ecosystem itself to succeed. Breaking could help differentiate their own products, but it will be at the detriment to the ecosystem itself. So I doubt they do anything that will break it. What I do see happening is them using the ability to alter core OS functions to their benefit by creating added functionality that they can test and have fully ready before adding it into the ecosystem. That way, they don't break anything because they are making it available to everyone else. But since they have already tested it internally, they will always be the first to market with devices that take advantage of the new functionality and hardware support.